UPDATE: Samsung's spokewoman Chenny Kim has confirmed that the reason for postponing the Android ICS/Nexus Prime debut is Steve Jobs passing away: "We believe this is not the right time to announce a new product as the world expresses tribute to Steve Jobs's passing,"
Google and Samsung just came out with a joint statement that they won't be holding the Samsung Mobile UNPACKED event at CTIA next Tuesday. It was dubbed "Something BIG is coming" in a teaser recently, and was widely expected to see the announcements of the Samsung Nexus Prime and Android Ice Cream Sandwich. Both topics of the event were leaked today in a supposedly Nexus Prime running Android Ice Cream Sandwich video. We don't know if this has anything to do with Steve Jobs passing away, or something else is brewing, but it's a disappointment to say the least. We'll keep an eye on the developments and update as soon as we know when a new date has been set up. noooooooooooo! well maybe a Yes. maybe they're adjusting it so that it will differ from the leaks. MORE EXCITEMENT. lol. you seriously think they delay their announcement because of a leak? You know how hard it is to "Adjust"? Cnet already got a response from Samsung spokesperson, it is because of Steve's passing. Haha, they probably are too busy ordering an iph4s! Yeah, the 4S introduction was so mind-blowing that Samsung and Google will both need to do some serious soul-searching before they even think about launching new products. Wait, am I getting thumbed down by Apple fans who understand sarcasm, or Android fans who don't? Both. Either case qualifies you as retarded. Only you would take months to order a phone. Go get help. This is only happening because Steve Jobs' funeral is on Tuesday and Samsung/Google CEO's are attending it. It's not going to be pushed back a month, maybe a week or less. Haha i got a -32. Thats great! What a bunch of idiots. Cant take a joke. U android ppl should be used to it, since you use the joke os of android. Hawk, you've apparently decided to crawl back out of your hole. This was a bad mistake. Don't panic... an event delay doesn't necessarily mean a launch delay. And at the rate the Prime is leaking, do we even need an official announcement? True. Just wanted to at least see what the launch date is for the different carriers. Yes!!. It would have been great to have confirmation of some actual information, solid information, as well as BigV staking a claim on it. What a f@%¤????? 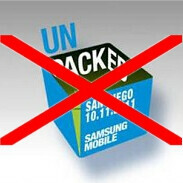 Whats up with all the disappointments... first apple gives out iphone 4s instead of iphone 5 and now google/samsung is delaying unpacked? PEOPLE! Calm down! I don't know what is the big rush towards all new announcements? Those mean only that we have to spend our (hard earned) money on little more advanced gadgets. I say NO! Until manufacturers came out with something spectacular and mind blowing must have device, like 2-3 days battery life of battery with heavy usage, bendable displays, holograms or projectors at least or something like that - No I won't buy slightly more tuned processors and little higher resolution screens, or super duper plus HD ultra fancy schmancy AMO-or-any-other-LED and 3D, not even 9D. Give us something worth of that high price tag you ask! Those features would cost you thousands of dollars and are years away, if you want to keep using your flip phone until then, go ahead. But from what I've seen of the Nexus Prime (or whatever it will be called), it seems far more advanced than my Droid Incredible, and I'm ready to upgrade. Probably because of Steve Jobs. It wouldn't be right to steal all the thunder after the death of the man who practically started it all. Its like an insult to his memory. After all, without Jobs, there wouldn't be android. And I know many of you would disagree but its true. Postponing the event is the least they can do to honor Jobs and his life's commitment.